We've all heard that theatre changes lives, and PlayGround certainly changed mine: five years ago, PlayGround cast me in a reading of a commissioned play that Barbara Oliver was directing. I loved the script; it had grown out of a Monday Night PlayGround piece, and it had not one, but four fabulously-penned women (quite the rarity on the American stage). The only issue was that I needed a ride from BART to the rehearsal at Barbara's house. The playwright himself offered to ferry me, we made strong impressions on each other in the 10 minutes we were in that car, and now we're married. I've always loved that PlayGround gives you permission to throw spaghetti against the wall and see what sticks — and sometimes it's a beautiful moment, sometimes it's a provoking thought, and sometimes it's a life partner. 10 minutes can be magical, indeed. INVEST IN THE ARTISTS! 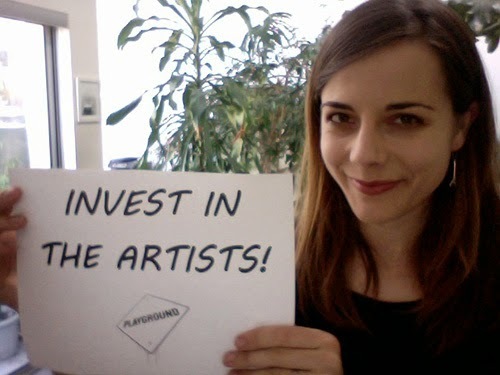 As we countdown twenty days of PlayGround's 20th Season Year-End Campaign, we're pleased to share with you a daily testimonial from PlayGround artists, subscribers and supporters and community leaders. To participate in the Year-End Campaign, make a tax-deductible contribution online at Causes.com or on the PlayGround website, or call us at (415) 992-6677. And it has forty two several hours associated with energy rolex replica uk. Therefore, you are not obtaining a good in house rolex replica uk as if you might along with a few of the more expensive rolex replica, such as the Large Boom UNICO. Nonetheless, the actual Sellita rolex replica is really a strong motion as well as, thinking about all of us are considering a good replica watches level design right here, actually the actual staunchest in house replica watches snob would need to begrudgingly take which truth. The actual obvious replica watches back again is actually good looking, as well as there is no danger associated with complicated this particular replica watches along with an additional manufacturer.